Just a few more hours and Lent will officially be over and done with for 2013 and we will enter into the mystery of the Triduum when the Church reflects on the greatest love story ever told. Tonight, as a Church, we gather to celebrate the institution of the ministerial priesthood and of the Institution of the Body and Blood of Jesus Christ given to feed us. Tomorrow, on Good Friday, we will witness the suffering and death that Jesus endured as he hung upon the cross and then at the Easter Vigil will mark that moment when death was abolished liberating us from the grip that it once had on us. Take some time, friends, to have a grateful heart; take some time to encourage young men to consider the Priesthood of Jesus Christ and give glory to God for his immense love for us. I have celebrated the Mass of the Lord’s Supper in the past, both as a Parochial Vicar ( or victim….sorry Fr Bouchard, jk!) and also as a Parochial Administrator but I am so eager to celebrate with the people of Saint Mary’s in South Dartmouth who have become my new spiritual family. Although imperfect, I attempt, each and everyday to rededicate myself to serving their needs and so, for the times when I have failed, I beg for your mercy. In his homily earlier today, when the new Bishop of Rome gathered with his priests in the Lateran Basilica, he reminded them that if they are happy priests, the people who have been entrusted to their care will likewise be happy, holy and healthy. I try…please continue to pray for me as I pray for you. Here is the text of the Holy Father’s Chrism Mass homily. Certainly worth a quick read. 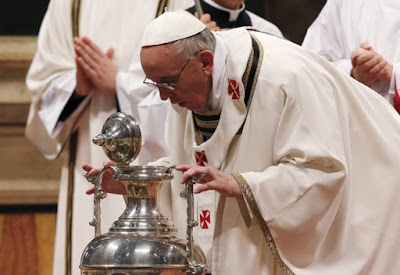 This entry was tagged Holy Thursday, Pope Francis Chrism Mass homily, serving people of st mary's South Dartmouth, vocations to the priesthood. Bookmark the permalink.